The Hosted Services ASP Contract is an agreement for providing services hosted by your company to clients as an ASP (Application Service Provider). Use this when you are providing use of your application software from a centralized location to your customers located elsewhere. This Hosted Services ASP Contract is included in editable Word format that can be customized in Word or by using the included Wizard software. THIS AGREEMENT is made this Current Day day of Current Month, Current Year by and between Company Name ("Company") and Company Name ("Customer"). The purpose of this Agreement (hereafter referred to as the "Agreement") is to set forth and define an arrangement under which Company will provide Hosted Web Services ("Hosted Services") on behalf of Customer. As a service, the standard Services Agreement with Company is provided below. 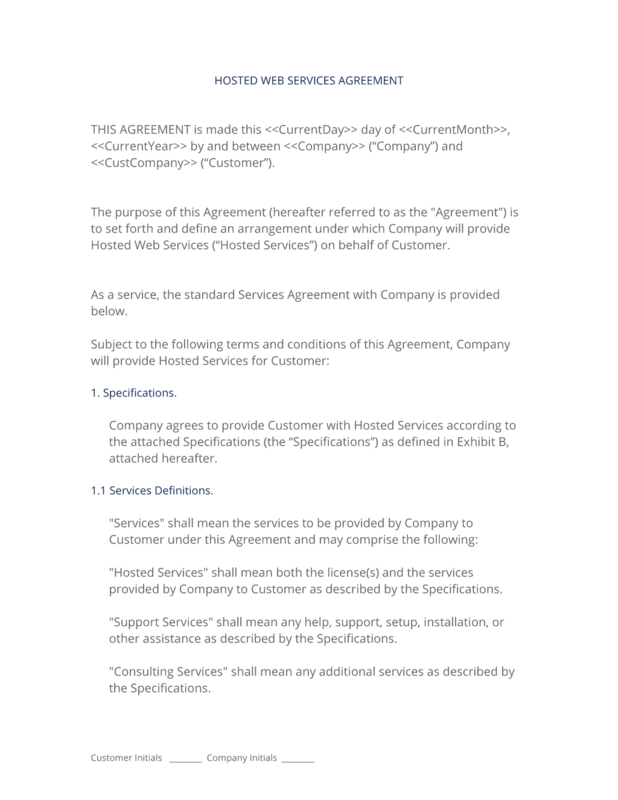 Company agrees to provide Customer with Hosted Services according to the attached Specifications (the "Specifications") as defined in Exhibit B, attached hereafter. "Hosted Services" shall mean both the license(s) and the services provided by Company to Customer as described by the Specifications. "Support Services" shall mean any help, support, setup, installation, or other assistance as described by the Specifications. "Consulting Services" shall mean any additional services as described by the Specifications. "Company Materials" shall mean any software, code, or other materials transmitted to Customer in order to provide any of the services under this Agreement. Company hereby grants to Customer a limited, non-exclusive, royalty-free worldwide license, during the Term to use the Services and/or any software provided to Customer under this Agreement for the purpose of using the Services. Customer shall have no right to use the Services for any other purpose, implied or otherwise, unless defined in the Specifications. At no time will Customer hold title to or ownership of any of the Hosted Services or Materials provided to Customer during the term of this Agreement. Customer agrees to an initial six (6) month or twelve (12) month contractual term of service ("Term"). The length of contract required is based on the type of service desired by Customer and shall be determined solely by Company as defined in Exhibit A. This agreement will automatically renew for successive six (6) or twelve (12) month Terms unless canceled in writing by Customer at least thirty (30) days prior to the end of Term renewal date. Renewal prices are subject to change. Renewal of Services by Customer indicates agreement to any contract revisions and price changes. Renewal fees for the following Term will be automatically invoiced to Customer's account. End-User Pricing and Services Compensation are outlined on Exhibit A, attached, and are subject to change at the sole discretion of Company. Terms of payment are C.O.D. unless credit approval has been granted by Company. If credit approval has been granted, credit terms are net ten (10) days upon receipt of invoice. Company reserves the right to revoke any credit extended if payment is in arrears for more than thirty (30) days. Proprietary information exchanged hereunder shall be treated as such by Customer. This information shall include, but is not limited to, the provisions of this Agreement, product and services information, materials, software, code, pricing, or any other materials transmitted to Customer under this Agreement. Customer agrees not to (a) decompose, disassemble, decode, or otherwise reverse engineer any Company program, code, or technology installed or delivered to Customer or any portion thereof; (b) transmit or allow to be transmitted any such materials to any third party except as necessary for the fulfillment of this Agreement; (c) sublicense or allow use of any materials or use of any provided services to any third party without written permission from Company; (d) use any Materials or Services in any way not intended or expressly provided for by this Agreement. Company will exercise no control whatsoever over the content of the information passing through the network, email, or web site. Company makes no warranties or representations of any kind, whether expressed or implied, for the Service it is providing. Company also disclaims any warranty of merchantability or fitness for any particular purpose and will not be responsible for any damages that may be suffered by Customer, including loss of data resulting from delays, non-deliveries or service interruptions by any cause or due to errors or omissions of Customer. Use of any information obtained by way of Company is at Customer's own risk, and Company specifically denies any responsibility for the accuracy or quality of information obtained through its Services. Connection speed represents the speed of an end-to-end connection. Company does not represent guarantees of speed or availability of end-to-end connections. Company expressly limits its damages to Customer for any non-accessibility time or other down time to the pro-rata monthly charge during the system unavailability. Company specifically denies any responsibilities for any damages arising as a consequence of such unavailability. Customer warrants that Customer has the right to use any applicable trademarks or copyrighted materials that Customer integrates or uses in connection with this Service. Customer may not assign or transfer this Agreement, in whole or in part, without the prior written consent of Company. In the event that Customer contemplates whole or partial sale of Customer's business, ownership change, or change in jurisdiction, Customer shall notify Company by mail, facsimile, or email no less than sixty (60) days prior to the effective date of the event. Company may terminate this Agreement at its sole discretion upon the occurrence of one or more of the following events: 1) failure to comply with any provisions of the Agreement upon receipt of written notice from Company of said failure, 2) appointment of Receiver or the filing of any application by Customer seeking relief from creditors, 3) upon mutual agreement in writing by Company and Customer. If any provision of this Agreement is held to be unenforceable, the enforceability of the remaining provisions shall in no way be affected or impaired thereby. This agreement and any disputes arising here under shall be governed by the laws of State State. A failure by any party to exercise or any delay in exercising a right or power conferred upon it in this Agreement shall not operate as a waiver of any such right or power. The parties represent and warrant that, on the date first written above, they are authorized to enter into this Agreement in its entirety, and duly bind their respective principals by their signatures below. The complete Hosted Services ASP Contract - with the actual formatting and layout - is available in this Contract Pack.